Journal of International Japan-Studies, No. 1, 2004. YE Ximin, YOSHIDA Shigeru’s view of China and the 1952 Japan-china peace treaty: focussing on the December 1951 negotiations between Yoshida and J. F. Dulles, pp. 5-31. SHIN Hyeran, The reception of MURAKAMI Haruki in South Korea, pp. 33-54. SUZUKI Tsuraki, Japanese views on China in the Taish? era: focussing on Japanese interpretations of Chinese Revolution, pp. (47)-(85). MIZOKAWA Koji, The national identity of medival Tsushima, pp. (23)-(45). 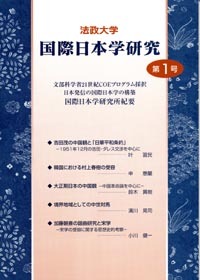 OGAWA Ken’ichi, KATO Bansai’s studies of noh and Chinese Song-dynasty Confucianism: the Japanese reception of the doctrines of ZHU Xi, (1)-(21).